Dave Callahan likes to challenge his teams. 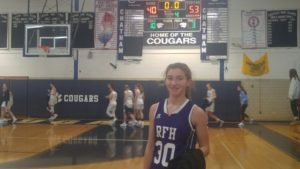 Last year RUMSON FAIR HEAVEN played one of the toughest schedules in the state. This year with his team hit hard by graduation, it only made sense to dail back the schedule. RFH had exactly 3 players returning who played meaningful mins last year. Michaela McGarvey who is out with a ACL injury made it 2 players with game experience. Lucy Adams played but she was a baby last year. But RFH does have one returnee that not just played meaningful minutes. But she also proved on a number of occasions she could carry a team….and That’s what Tori HUDUKE did for 16 mins yesterday. 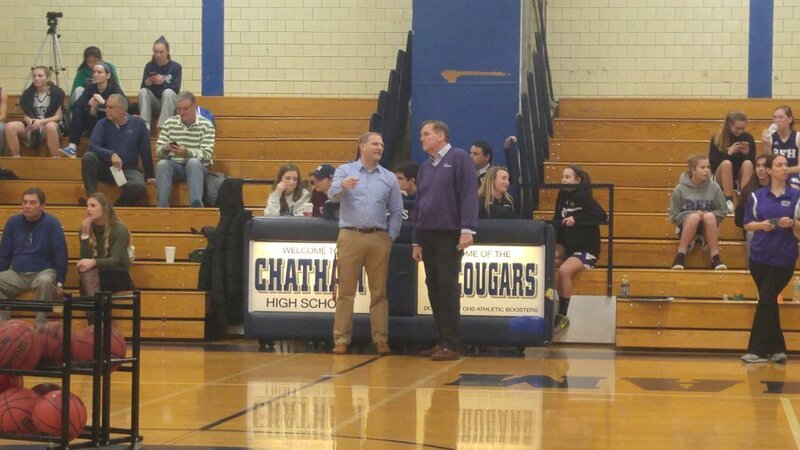 Chatham High School is far from the powerhouse teams that RFH will see later in the year. But they have a D1 post player in Veronica Kelly and surround her with talented shooters. Yesterday for 16 minutes they appeared to prove what most knew about RFH, that they are inexperienced and new to the bright lights. They put real pressure on the BULLDOGS early, hitting three point shot after three point shot. When they weren’t knocking down three’s they dumped the ball inside to their Dartmouth bound senior Veronica Kelly. 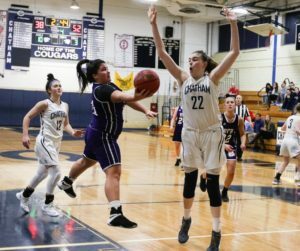 Chatham tried to run away from RFH in the first half. But they couldn’t because Tori Hyduke played the role of Wonder Woman. Hyduke banged out shots with defenders hanging all over her. She also brought her lastest new weapon to her game..the deep..deep ball. She hit three’s from the parking lot as in 4 in the first half. They when Chatham tired to pressure her, she drove to the rim with twisting, spinning crowd pleasing layups. Her teammates during this time were frozen in time. They missed wide open layups and wide open jumpers. It appeared the lights were too bright for the puppy dogs…but Hyduke’ antics gave the puppy dogs a chance to be big dogs and redemption in the 2nd half. 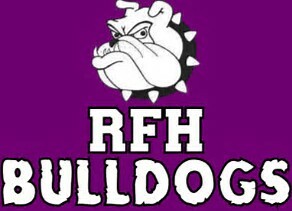 Hyduke scored 20 of RFH’s 24 first half points as the Bulldogs trailed 27-24 at half time. When the 2nd started one thing was clear. Chatham, was sharing the wealth as it seemed everyone had chipped in on the scoring. Now they were all going to chip in on guarding Hyduke. The grabbedher, pushed her, switched on screens and hand offs. RFH needed a cure to there problems of scoring. 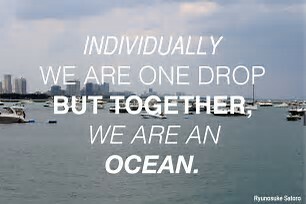 One player cannot beat a team. The baby Bulldogs needed medicine and medicine arrived in the name of Freshman CORTLAND McBARRON. This puppy became a Bulldog as she scored 8 straight points as RFH rushed to the lead. But more importantly the other RFH puppy’s saw what she was doing and relaxed and joined into the party. LUCY ADAMS became a rebounding machine as any ball that came of the rim was hers. She also brought the handcuts out and slapped them on the Chatham’s star Veronica Kelly who had a double/double on the day. Adams then ran the floor was no regard for life or limb and insprised her teammates. She was sensational and showed she is a future mega star. Then Coach Dave Callahan opened up his dog pound. PHOEBE SPERNAL came running off the bench and got a backing breaking offensive rebound for a big bucket. They she played hounding defense and Dove on the floor. SPERNAL took a big bit out of Chathams Spirit. It was then when Coach Callahan turned the puppies who had become Bulldogs into JUNKYARD DOGS. Coach Callahan went to his full court pressure and unleashed his dogs as they hounded the Chatham guards into submission . In the first half Chatham had pushed the ball, now they played at a snails pace. It was here when RFH lowered the boom. It was here that the Junkyard Dogs got down and dirty. Beaming with confidence and Lucy Adams dominating the paint with her rebounding and shot blocking. The game became a one way track meet. Chatham turning the ball over or taking ill advise shots. 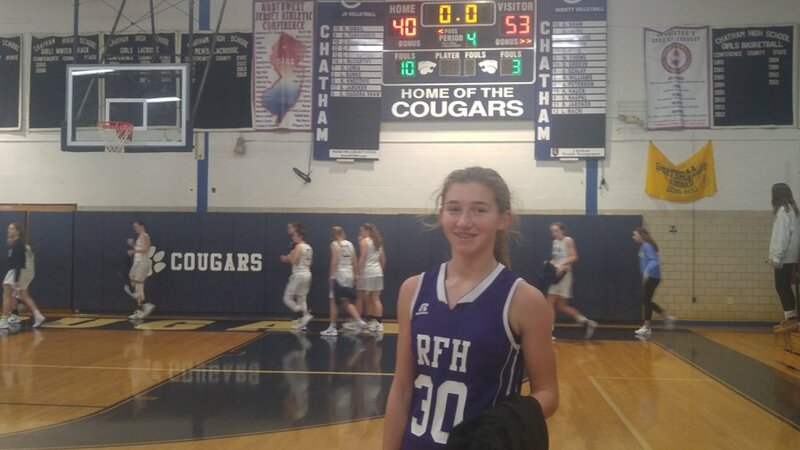 It was why RFH was able to out score Chatham by 13 points and take a 10 point lead going into the 4th. Dave Callahan may not have taken a shot, but he scored points from the bench yesterday. In the 4th quarter, no question Chatham was prepared for more pressure. What they were not prepared for was a zone defense. Sometimes extended, sometimes packed in, jumping in and out of passing lanes, slowing Chatham’ ball movement. Coach Callahan went to a zone against a team that shot the lights out of the ball in the first half. Why would he do such a thing? Because he knew Chatham would stand around and he also knew their shot selection was suspect. Missed long jumpers lead to run outs and that exactly what happened as the TORI HYDUKE show resumed in the 4th. Hyduke mad dashes to the rim that were a thing of beauty. She made floaters , pull ups in the lane. She changed directions and broke ankles and hearts. But it was one play that sent CHATHAM on its merry way. GRACE MUNT streaking down the floor and catching a pass thrown what appeared to be over her head. But the stud freshman leaped and grabbed the ball and to had insult to injury she scored. It was here that Chatham had enough. It was here that RFH knew that they were a team a team with a future. Tori Hyduke ended up with 35 magical points. But she got plenty of help from her teammates, as everyone chipped in. A box score only shows stats, it doesn’t show hardwork, team work, pride and unselfish play . All the things RUMSON FAIR HEAVEN DISPLAYED YESTERDAY. DAVE CALLAHAN is proving to be one of the best in game coaches…PERIOD. 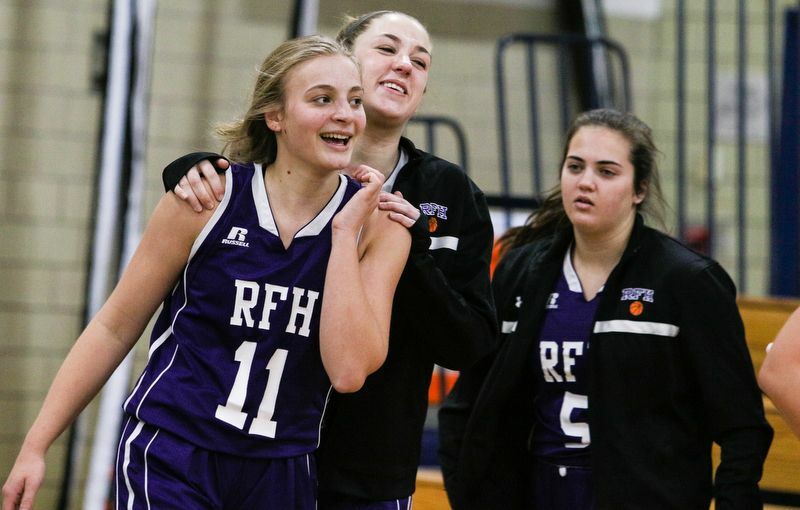 The young Bulldogs are proving they are going to fight every night as a TEAM..Yesterday we got a real glimpse into the future and for RFH it’s looks very bright….and oh yeah…TORI HYDUKE Just threw down the PLAYER OF THE YEAR Gauntlet as if to say…CATCH ME IF YOU CAN…good luck trying if yesterday is any indication of whats to come.